but I agree that it's a tough call on both sides. Do something and you risk overreacting. Do nothing and you risk endangering passengers. I mean, letting the plane take off AT ALL risks endangering passengers. Delaying the flight also has distinct and measurable impact on the lives of passengers. Consider... In what possible universe could this be a credible threat? 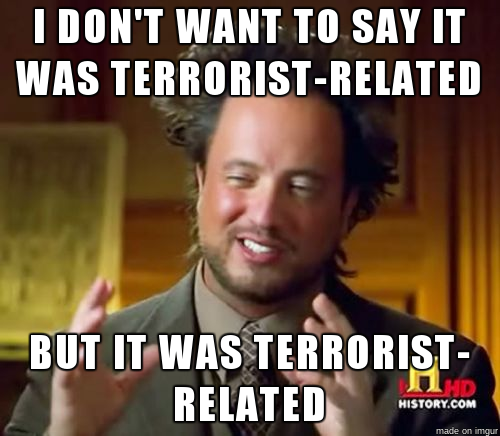 You're positing the existence of a terrorist that is simultaneously competent enough to build or acquire a wifi-triggered bomb, get it onto the plane undetected and have it located somewhere that it will do enough damage to matter, and fly so completely under the radar that there's no other evidence of risk to the flight... yet so incompetent that not only do they broadcast their SSID, but they think the irony in the name is worth risking the entire operation? Even if such a terrorist exists, what's the worst they can do? As soon as he (she?) threatens to detonate the bomb he'll have half of the rest of the passengers pinning him to the ground and loosening his teeth the old fashioned way - no hijacking there. Or detonate the bomb and take out everyone in the plane, possibly over a populated area. That's definitely a tragedy, and it would inch flying slightly closer to being more dangerous than driving, assuming there are more such uniquely qualified terrorists. But if that was going to happen, the tragedy was NOT in failing to react to the wireless network name. It was failing to identify the plot BEFORE it reached the plane... because if the only reason we avoided a terror incident was because of the name of a wireless network, then that's a failure rather than a success. I really don't think it's in any way a tough call.